End At the locked gate on Sherrit Lane east of the Donner Summit Public Utilities District building. Sherrit Lane may or may not be plowed to the gate. Do not park near the PUD building. Exit I-80 at the Soda Springs exit. On the north side of the highway turn northeast (right) onto Sherrit Lane. 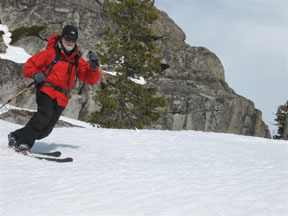 The Firehouse Run is named for the fact that after climbing to the summit of Andesite Peak it descends to its terminus near the Donner Summit Public Utilities District and Truckee Fire Protection District station. 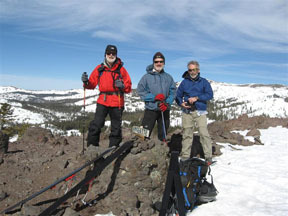 While the climb to the summit is relatively straight forward, the descent is more challenging and requires a compass at times to stay on course. On the positive side, this tour has a net loss of 500 feet. But the most difficult task is finding parking at the end of the tour. The abundant parking near the PUD building is off limits to recreationists. If you are lucky you can find some space or dig out a space beyond the building on narrow Sherrit Lane if it is plowed. 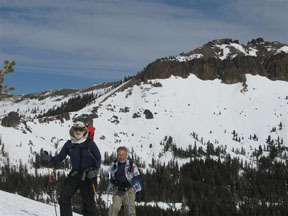 The first 1.7 miles is identical to the Andesite Peak and Ridge tour. 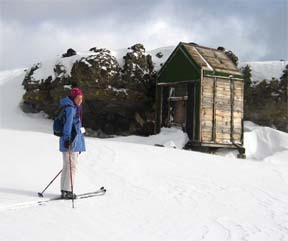 Most of the climb to the summit is along the ridge where the timber ranges from nonexistent to heavy. In open areas winds from the west can form cornices on the lee side of the ridge and peak; stay away from the steep edges in these areas. Although you have some glimpses at points along the way, the vistas from the summit are much better; frankly they are outstanding. Nearby is Castle Peak, but there is much more to see. Off in the distance to the southwest is unmistakable Devils Peak that can be used as a landmark during the descent. The decent from Andesite Peak generally follows a ridge line but care in navigation is needed to avoid the tendency to veer to the west. You will find open areas as well as dense timber on the way down. Turn west (left) and follow the snow-covered road for 0.2 mile until you reach a location where you can leave the road to the north (3). There is no landmark here, but the route to the north heads up a drainage between two knobs. 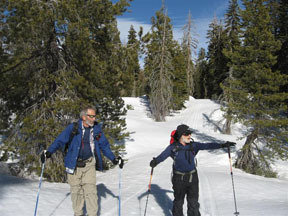 Leave the road and ascend northwest and then north for a total of 0.1 mile until you reach Andesite Ridge (4). Follow Andesite Ridge to the northwest for 0.6 mile until the terrain abruptly becomes more steep and then 0.5 mile more to the summit of Andesite Peak (5). 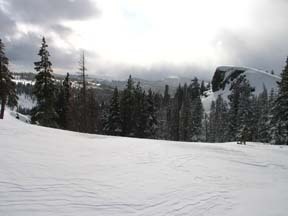 Descend slightly west of south for 0.5 mile until you reach a location just to the west (right) of Peak 7826 (6). You may want to visit the top of the peak but the route passes to the west of it. 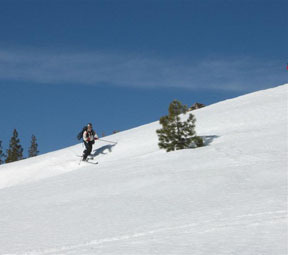 Descend south for 0.5 mile until you reach a location just to the west (right) of Peak 7563 (7). Again, you may want to visit the top of the peak but the route passes to the west of it. 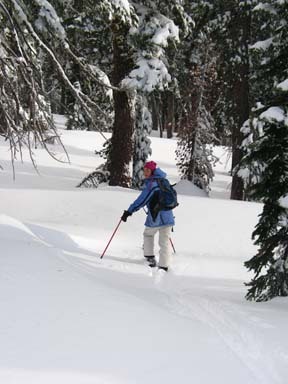 Descend southwest for 1.0 mile until you reach buildings (8) to the north of a power line easement. You want to pass the buildings to their west (right). Descend southwest for 0.1 mile until you reach the end of Sherrit Lane (9). This point is just south of the power lines. The gate may be buried by snow, but you should be able to discern the road cut through the trees. Continue down Sherrit Lane if necessary to reach your vehicle.